Companies are starting to realize that group innovation is the key is to solving problems. Group innovation, however, is not always a smooth process. Another problem is that throwing in an idea for public consideration generates fear of failure; workers hoping to advance their own interests often keep their best ideas to themselves until a more opportune time. So, what is the best method for group innovation? Boyd suggests that instead of identifying a problem and then seeking solutions, group innovation works the other way around: “Break down successful products and processes into separate components, then study those parts to find other potential uses.” This process is known as systematic inventive thinking. Innovations can then results from the “pre-inventive” ideas that are formed using this process. OneDesk facilitates the group innovation process by allowing individuals to collaborate and share ideas. This allows companies to collect feedback and ideas and identify which of their products or services are the most successful. They can study the feedback they receive and identify what customers want. They can then break down the feedback into requirements and from there, generate tasks to be worked on. 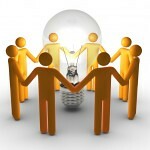 Throughout the process, companies can collaborate with all stakeholders and an clear up any uncertainties.